I need to hold office hours as part of my work week. I meet with students individually to discuss scholarly concerns, elaborate on assignment details and answer language questions they may not have had time to ask. Without any obvious tool on Blackboard to do so, I’ve looked for alternatives: posting a sign-up sheet outside our office every week, using Google spreadsheet and trying out a new feature called “Appointments” on Google calendar. One has stood out most successfully. Pros: I didn’t have to adhere to or maintain regular weekly office hours. This wasn’t possible given the fact that we had to walk around the building looking for open rooms to conference with students (our office is shared and not conducive to student-teacher dialogue). Another was that students could sign-up themselves. Cons: Every week I had to recreate this schedule on Google docs (not actually the easiest task when playing around with tables) and print it out. I never care for replacing one paper with another fresher one. Also, if students changed their minds, there ended up being scratches and scribbles and names upon names in tiny squares. Here, I created a similar sign-up sheet to what I did in Word, decorating the grid to appear like a weekly calendar. I shaded my class times grey and used pink for appointment times (each line represents a 15-minute slot) and blue for drop-in times. I also made some guidelines on the side for students to consider. Pros: It’s just as easy to read as the Word doc, but without the printing on and recycling of paper. If shared with anyone who has the link, no Google sign-in is required and therefore students can type in their names in the appropriate areas to book appointments. 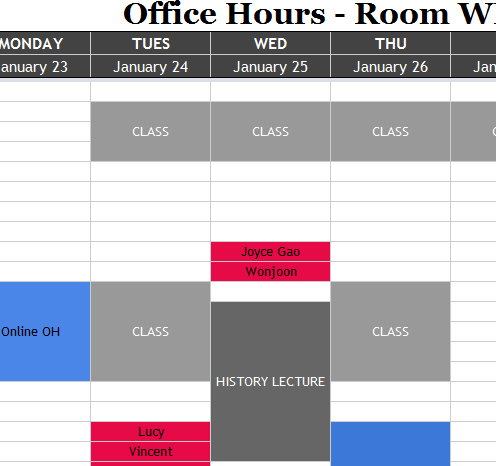 The link remains permanent, even if the content changes, so I can post the link on Blackboard once and just change the office hours every week. Cons: Since anyone can edit it, I’m not sure if students have deleted other students from appointment slots. Even if I check revision history, I’m not sure if a student switched on purpose or maliciously. On those same lines, students can type where inappropriate, like on drop-in times or erase something. Of course, restoring through revision history could help here. 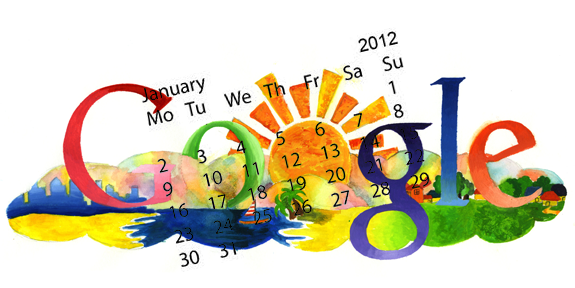 When I noticed that Google calendar had a new feature called “Appointments”, I was so excited. Finally, a functional tool that is meant exactly for this purpose: creating office hour appointments! I quickly set it up and explained to students how to do it. Click here to go see what the calendar looks like. Book at appointment for fun. Pros: It’s very professional looking. Appointment slots show up as silver boxes on the calendar view. A student clicks on it, books their appointment and their name shows up on my end. Google also sends reminders to me that appointments are scheduled. Cons: Sigh. The first is everyone needs a Google account to participate. Ok, that’s not the biggest deal. Most people do. However, even though I put class times and other things on my side of the calendar, the version anyone else saw only had the appointment slots shown. There seems to be no way around this. Additionally, when a student booked the appointment as above, it didn’t say “booked” or anything of the like, any evidence of their having been office hours then disappear from view to students! Many emails were sent to me saying they couldn’t see any office hours slots–that’s right! They were already booked by other students. Another problem: for some reason, not all students could see appointment slots, even when available. Third, after I’d made some appointment times available from 4:30PM on, when I checked what students saw, the slots had mysteriously moved to earlier times, like 1:30PM, a time I actually would be in class. Very confusing. So after trialing all three? The winner is B – A shared Google spreadsheet! Sure, the downside tends to be the fact that students don’t require signing in with a Google account and it can be an inconvenience to look through revision history to figure out if anyone’s been mischevious, but so far, the honour system seems to have worked out. I really liked the Google Calendar Appointments, as it really seemed to be developed for this purpose, but until the glitches and functionality are worked out, I don’t see how I can rely on it. If you need to make appointments with students or update a changing schedule from time to time, I highly recommend Google spreadsheet. This post is part of the Ed Tech Blog carnival #1: http://www.whiteboardblog.co.uk/2012/01/the-ed-tech-blog-carnival-2012-1/. I have used signupgenius.com for scheduling with students. It’s easy and works great! Thanks for the suggestion, Sue. Do students need to register to use it too? That’s one of the advantages of Google docs in that they don’t. I gave http://youcanbook.me/ a shot with parent-teacher conferences a year or so ago, which worked very well – I don’t use it consistently due to limited tech usage by current parent body, but it was great and does not require others to have Google accounts. Might solve many of your issues? Ahh! That’s a great resource, David. Thank you. I’ve tried out the demo and it seems to have all the features I was looking for. I’m not sure what a booked appointment looks like, but it did it OK. My only immediate concern (I loosely use “concern”) is that it’s a little ugly. Maybe there are themes that I didn’t check out in my 5-minute trial. Apologies, mistyped email in previous comment. Keep mixing up the A and the shift key on my iPad. My friend loves Doodle.com and always uses it to arrange meetings. Cool, Phil. Thanks for the extra suggestion, noted. One other principle factor here is that I can’t be stuffed sending individual invites to all the students (this tool looks like that’s an essential part of the process), so Google has worked in that all anyone needs is a direct link. Perhaps the best solution would be to have a secretary! LOL! Please DO post about google docs, I could use it! Haha! I’d love to have a secretary year round (I have an assistant during the summer months when I’m a program coordinator). Unfortunately, that just doesn’t fly when I’m teaching. I’ll do something on Google Docs in the coming month or so. However, to comment on what you’ve done.I’ve also use a shared Google Spreadsheet for booking appointments, and a few other organisational things. In my case, i made the studnets sign in, as we have Google Apps for their email etc., so I know they have an a/c. So far,no-one seems to have edited anyone else out! Punctuation seems to have shown up, Emma. =) I’m curious about your sign-in situation: from the sharing options I can see on the Google spreadsheets, if they sign-in, you need to “invite” students, which is a process I don’t want to bother with. Am I missing something?